Nanakuli Wetlands - A Student Perspective from Malama Learning Center on Vimeo. ​There are many reasons why clean water, whether it's fresh or seawater, is so important. A few are that our bodies need safe freshwater to survive, plants and animals also need clean water, and we enjoy living on islands surrounded by water! But how do we know if the water we drink or swim in is clean and safe? Appearance alone will not tell the full story. And everyday, the water we rely on is impacted by our actions (or inaction). That is why we are embarking on a new project to help educate students, teachers, and community members about water quality and more importantly, how to sustain clean water. More than a science lesson, there are also many connections to Hawaiian culture and knowledge that are being made through our activities that focus on the lands and waters of the Leeward coast, especially Nānākuli. We got a head start on these projects through the Mālama ʻĀina Field School students' projects at the infamous "stink pond" in Nānākuli in 2015. 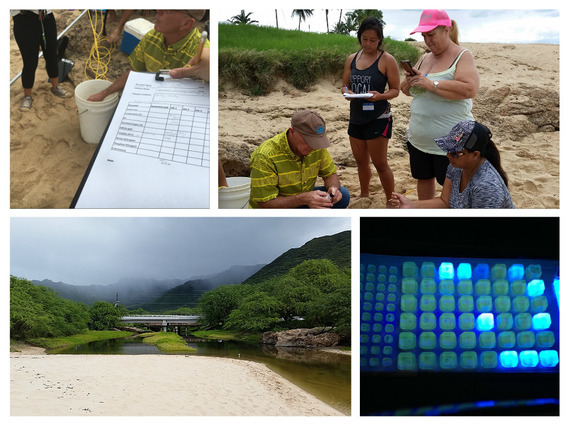 On December 5, 2015, we formally started the project as teachers from Kawaihona O ka Na ‘auao, Nānākuli High & Intermediate, Kapolei High, and PALS & PLACES gathered for a training workshop to learn from water quality experts. Dr. Carl Berg of the Surfrider Foundation, Kaua‘i Chapter, flew in special to train us on monitoring for key health parameters such as Enterococci. He shared his experiences leading a “citizen science” effort with surfers on Kaua‘i to monitor their shorelines and encouraged us as we embark on our own efforts on the Leeward Coast, starting in Nānākuli. Our study of water quality will take us to the shorelines and up to the mountains to understand the interconnectivity within a watershed. We will also study the impacts of marine debris and taking action to reduce it along the coast. Since then, we have been “regulars” at what is commonly known as Zablan Beach in Nānākuli. It is a section of the park recently renamed Kalanianaʻole Beach Park. Unlike most beach and park visitors, however, we’re not there to rest and relax. We are helping local students and teachers create an outdoor classroom with endless opportunities. As citizen scientists, we are taking water quality measurements, studying native and invasive plants, observing the aquatic life in the stream, and exploring the connection between the wetland to the watershed of Nānākuli. We pick up litter that can become marine debris, and we have begun to bring native plants back to the wetland area in test plots. We also talk to the people who use this area regularly, and learn what they observe as well. It’s a fascinating journey that will get even more exciting. This school year, we have engaged students and teachers from neighboring Ka Waihona O Ka Naʻauao, Nānākuli High & Intermediate School, Waiʻanae High School, Waipahu High School, and Kapolei High School as well as community groups and interested individuals. All are welcome! We thank all who have given their time to get us to this point, including the teachers, Dr. Carl Berg, Natalie Waters and Ian Kitajima of Oceanit, Keith Matsumoto of Design Thinking Hawai'i, Tonya Ketza and Clint Jamile of the City & County of Honolulu, Annette Tagawa and Glenn Higashi of the Department of Land & Natural Resources, Black Hoohuli and Jewelynn Kirkland of the Ahupua‘a o Nānākuli Homestead, Eric Enos of the Cultural Learning Center at Ka'ala, Donna Kahiwaokawailani Kahakui of the U.S. Environmental Protection Agency (EPA), and William Aila of the Department of Hawaiian Homelands. These activities are made possible by grants from the EPA Local Grants Program, NOAA (National Oceanic and Atmospheric Administration) B-WET Program, support from PLACES (Place-based Learning and Community Engagement in School), and a penalty award facilitated by the EPA and U.S. Attorneys of the Department of Justice. Understanding the Nanakuli Muliwai - Learning Its History and Place in Time from Malama Learning Center on Vimeo. Restoring Place and People Through the Nanakuli Muliwai from Malama Learning Center on Vimeo.